امیری, حمیدرضا, حبیبی, حسن, حقیقت, مسعود, عینی نرگسه, حامد. (1397). یادداشت فنی: تأثیرات محتمل تغییر اقلیم بر مناطق مستعد کشت گندم دیم در استان کردستان. هواشناسی کشاورزی, 6(2), 80-85. doi: 10.22125/agmj.2019.113745. حمیدرضا امیری; حسن حبیبی; مسعود حقیقت; حامد عینی نرگسه. "یادداشت فنی: تأثیرات محتمل تغییر اقلیم بر مناطق مستعد کشت گندم دیم در استان کردستان". هواشناسی کشاورزی, 6, 2, 1397, 80-85. doi: 10.22125/agmj.2019.113745. امیری, حمیدرضا, حبیبی, حسن, حقیقت, مسعود, عینی نرگسه, حامد. (1397). 'یادداشت فنی: تأثیرات محتمل تغییر اقلیم بر مناطق مستعد کشت گندم دیم در استان کردستان', هواشناسی کشاورزی, 6(2), pp. 80-85. doi: 10.22125/agmj.2019.113745. امیری, حمیدرضا, حبیبی, حسن, حقیقت, مسعود, عینی نرگسه, حامد. یادداشت فنی: تأثیرات محتمل تغییر اقلیم بر مناطق مستعد کشت گندم دیم در استان کردستان. هواشناسی کشاورزی, 1397; 6(2): 80-85. doi: 10.22125/agmj.2019.113745. هدف از این مطالعه بررسی اثرات محتمل تغییر اقلیم بر مناطق مساعد کشت گندم دیم در بخش‌هایی منتخب از استان کردستان با استفاده از مدل HadCM3 تحت سه سناریوی انتشار (B1، A1B و A2) در دوره 2030-2011 می‌باشد. برای ریزمقیاس‌نمایی خروجی‌های این مدل، مولد داده LARS-WG مورد استفاده قرار گرفت. پهنه‎بندی مناطق مستعد کشت گندم دیم در محیط سامانه اطلاعات جغرافیایی ArcGIS نسخه 9.3 انجام شد. نتایج نشان داد که در دوره پایه (2010-1991) پهنه‌های مناسب برای کشت گندم دیم، در غرب و شمال غرب استان (محدوده ایستگاه‌های بانه، مریوان و سقز) واقعند که حدود 6/28 درصد از مساحت استان را در بر می‌گیرند. نتایج پهنه‎بندی نشان داد که تحت سناریوهای B1، A1B و A2 در آینده محدوده مناسب برای کشت گندم دیم 4/34 درصد افزایش می‌یابد و حدود 63 درصد مساحت استان را شامل خواهد شد. بین سناریوهای مورد بررسی (B1، A1B و A2) اختلاف معنی‌داری در تغییر سطح مناطق مطلوب دیم‌کاری گندم مشاهده نشد. This study was aimed to investigate the possible effects of climate change on rain-fed wheat cultivation regions in Kurdistan province, Iran, using HadCM3 model outputs under three climate change scenarios (B1, A1B and A2) during 2011-2030 period. The statistical weather generator model, LARS-WG was used to downscale climate variables. The agroclimatic zoning of suitable regions was performed utilizing ArcGIS 9.3 program. In the baseline period (1991-2010), suitable regions for rain-fed wheat cultivation were mainly located in west and northwestern regions of Kurdistan Province namely, Baneh, Marivan and Saqez stations which cover about 28.6 % of the total province area. Results of agroclimatic zoning during the future period showed that suitable regions area will increase by 34.4 % (63 % of the total area) under B1, A1B and A2 scenarios. No significant difference was observed between three climate change scenarios. Aggarwal, P. K. 1994. Simulating the effect of climatic factors, genotype and management on productivity of wheat in India. Agricultural Research Institute, PP. 1-11. Bidadi, M. J., Kamkar, B., Abdi, O. 2014. Suitable areas zoning of soybean cropping in Qaresoo basin by geographical information systems (GIS). Electronic Journal of Crop Production, 7(2): 175-187. (In Farsi). Deihimfard, R., Eyni-Nargeseh, H., Haghighat, M. 2016. Zoning of drought incident in Fars province under climate change conditions using standardized precipitation index. Journal of Agroecology, 7(4): 528-546. (In Farsi). Eyshi Rezaie, E., Bannayan, M. 2012. Rainfed wheat yields under climate change in northeastern Iran. Meteorological Applications, 19: 346– 354. Fallah Ghalhari, Gh., Asadi, M., Dadashi Roudbari, A. 2015. Determination of suitable regions for wheat cultivation in Fars province. Journal of Agricultural Meteorology, 3(2): 68-73. (In Farsi). Ghahroudi Tali, M., Babaei Fini, O., Ataei, H. 2015. Introduction to Geographic Information Systems. Payam Noor University, 234 pages. Gohari, A., Eslamian, S., Abedi-Koupaei, J., Massah Bavani, A., Wang, D., Madani, K. 2013. Climate change impacts on crop production in Iran's Zayandeh-Rud River Basin. Science of Total Environment, 44: 405-419. Hoogenboom, G., Jones, J. W., Porter, C. H., Wilkens, P. W., Boote, K. J., Batchelor, W. D., Hunt, L. A., Tsuji, G. Y. (Editors). 2003. Decision Support System for Agrotechnology Transfer Version 4.0. Vol. 1: Overview. University of Hawaii, Honolulu, HI. Kouzegaran, S., Mousavi Baygi, M., Sanaeinejad, H., Behdani, M. A. 2014. Identification relevant areas for saffron cultivation according to precipitation and relative humidity in South Khorasan using GIS. Journal of Saffron Research, 1(2): 85-96. (In Farsi). Ministry of Agriculture Jihad. 2014. Agricultural statistics, 2013-2014, volume 1. Available at:http://www.maj.ir/Portal/Home/. Nakicenovic, N., Swart, R. 2000. Emissions scenarios Special Report of the Intergovernmental Panel on Climate Change. Cambridge University Press, Cambridge. Prescott, J. A. 1940. Evaporation from a water surface in relation to solar radiation. Transactions of the Royal Society of South Australia, 64: 114-118. Rahmani, M., Jami Al-Ahmadi, M., Shahidi, A., Hadizadeh Azghandi, M. 2016. Effects of climate change on length of growth stages and water requirement of wheat (Triticum aestivum L.) and barley (Hordeum vulgare L.) (Case study: Birjand plain). Journal of Agroecology, 7(4): 443-460. (In Farsi). Sari Sarraf, B., Bazgir, S., Mohammadi, Gh. H. 2009. Zoning the climatic potentials of dry-farming wheat cultivation in the west Azarbaijan (Iran). 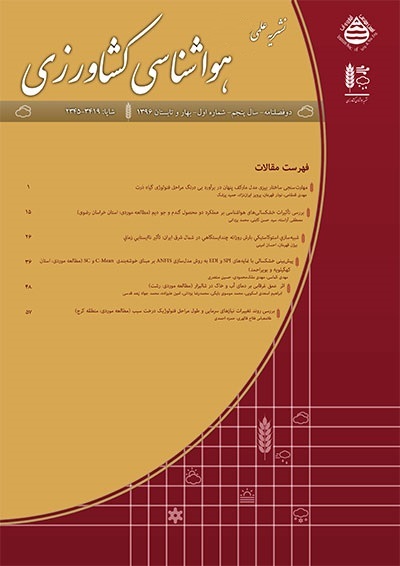 Geography and Development Iranian Journal, 7(13): 5-26. (In Farsi). Semenov, M. A. 2009. Impacts of climate change on wheat in England and wales. Royal Society, 6: 343-350. Semenov, M. A., Barrow, E. M. 2002. LARS-WG: A Stochastic Weather Generator for Use in Climate Impact Studies, Version 3.0, User’s Manual. Semenov, M. A., Stratonovitch, P. 2010. Use of multi-model ensembles from global climate models for assessment of climate change impacts. Climate Research, 41: 1-14. Soltani, A., Robertson, M. J., Mohammad-Nejad, Y., Rahemi-Karizaki, A. 2006. Modeling chickpea growth and development: leaf production and senescence. Field Crops Research, 99: 14- 23. Storie, R. E. 1976. Storie Index Soil Rating. Special publication Div. Journal of Agricultural Science. No. 3203, University of California, Berkeley. Sys, C., Van Ranst, E., Debaveye, I. J., Beernaert, F. 1993. Land evaluation. Part III: Crop Requirements. General Administration for Development Cooperation, Agricultural Publication-No. 7, Brussels-Belgium. 199 pages. Wallach, D., Goffinet, B. 1987. Mean squared error of prediction in models for studying economic and agricultural systems. Biometrics, 43: 561–576. Wilby, R. L., Wigley, T. M. L. 1997. Downscaling general circulation model output: A review of methods and limitations. Progress in Physical Geography, 21: 530-548.